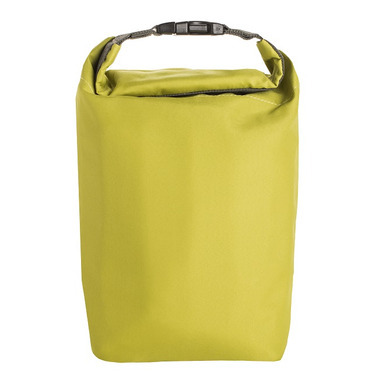 Eat lunch in style with the (re)zip Click 'n Go insulated roll top lunch bag. This versatile and functional bag is ideal for work, travel or day trips. The hook and loop top closure folds over and clips, making it easy to secure onto backpacks or other bags. The 50% post-consumer recycled REPREVE® bottle fabric exterior upcycles up to 4 plastic bottles. The interior lining is made from food safe FDA-grade PEVA material that is food safe, lead-free and BPA-free. Easy to clean, the bag can compress flat or roll up compactly when not in use.